Experimentation . 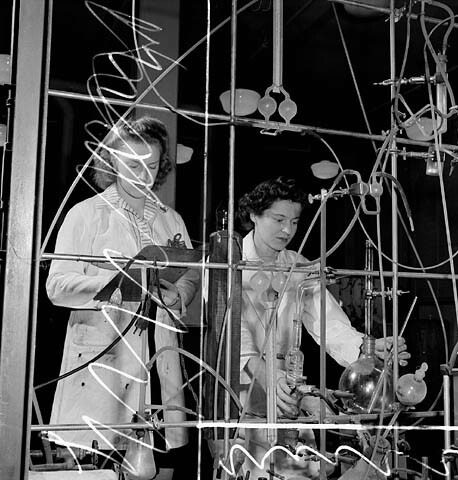 . . in a laboratory in 1944. 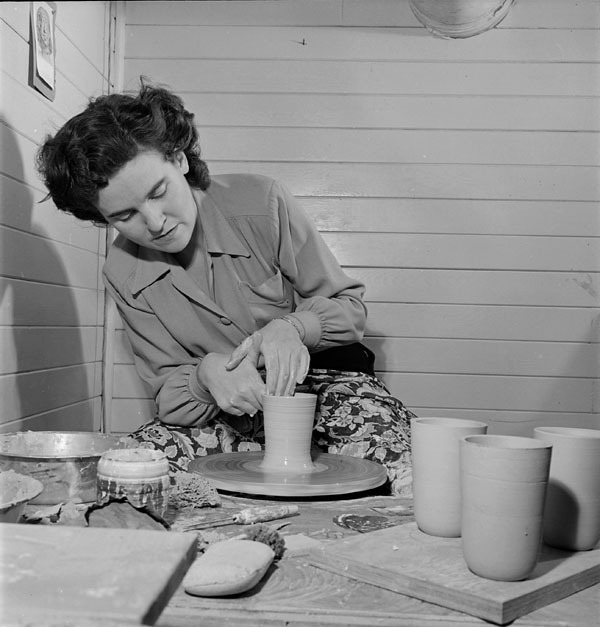 Pearl Sammett, National Film Board of Canada, Library and Archives Canada: 1971-271 NPC, e000761784. Literature loves to throw curveballs. Contemporary writers in particular often challenge expectations and assumptions about literature by purposefully disrupting them. Wynne Francis, writing on the 1960s literary scene, observes that Canadian literature became polarized between a mass market/mainstream culture (figured as the centre, or as culture itself) and the radical fringe that expressed a counter-culture of extreme experimentalism (Francis, Expanding 14; see also Davey; Francis’ Little ; and Lyndon). This moment broke away from what had become the acceptable Modernist-style free verse poetry or realist fiction to explore other forms of poetic and literary expression, a process of exploration that continues to this day. The division between mainstream and experimental or postmodern is porous and, thus, difficult to maintain. Likewise, a long list of global influences informs experimental approaches to poetry, ranging from the European avant-gardes to traditional Chinese calligraphy and ideography. Other recent and contemporary international movements like L=A=N=G=U=A=G=E , OULIPO, and Flarf also inform it. Nonetheless, this broad, radical fringe influences the more dominant contemporary Canadian poetry scene, with a variety of ideas, expressions, forms, and strategies making their way towards the centre. Along with, of course, the relatively recent burgeoning diversity of queer, ethnic, and Indigenous writings, addressed across CanLit Guides , visual and conceptual poetry, are noteworthy and somewhat related types of experimental writing (among a wider variety of others, including those mentioned above). Yet, they are often also difficult approaches to address or analyze, so we will focus more on them here (see Mancini for some ideological constraints on this criticism which we will not discuss here). 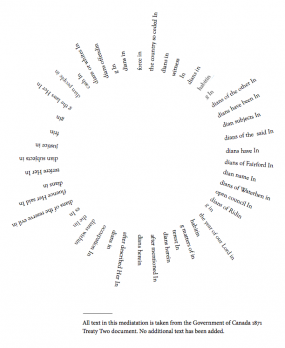 Visual poetry, and the broader movement of conceptual or experimental poetry in which it is involved, provides examples of works that purposefully unsettle traditional notions of literature and language. These works actively seek to undermine our assumptions of what makes up creative and meaningful expression and to reorient us as readers to how we read and what we find of value in texts. Found poets, for example, think up ways to appropriate and re-construe other people’s words through collage and other recombinatory and cut-up methods that produce alternative meanings of the source texts. 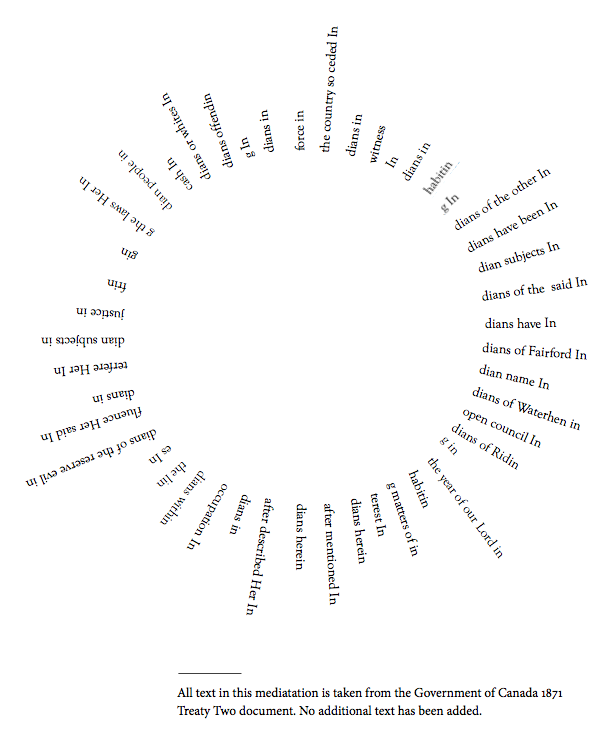 For instance, Shane Rhodes’ poem Circle The Wagons: In Ink: mediatation on Treaty Two takes phrases from a government treaty document and makes them into a visual poem, in turn, quite literally, reorienting and altering how we approach this document and what it says. Conceptual poems often derive from formulas devised to control interactions with texts through specific parameters for selecting, extracting, and re-presenting language used elsewhere. Thus, the poetry is generated through a concept or idea surrounding forms and styles of documentation and communication, rather than an image, narrative, or another focus typically associated with lyric poetry. For instance, John Cage popularized one form through chance operations that used an author’s name to develop a search pattern. This linked disparate words through a lengthy text in order to select and compress it into a mesostic. Other authors appropriate recognizable phrases and images to shift how we interact with them. derek beaulieu and Gregory Betts suggest that this type of writing is more like a writerly thinking, a form-consciousness that acts as a creative misreading in order to [capture] and [repurpose] the excessive creative energy in all texts. This style of engagement can even lead to more creative anti-readings than misreadings” (258). beaulieu and Betts offer a helpful discussion of this appropriative approach in their opinion piece, Copy Paste Publish: On Appropriation. See Canadian Literature #210/211, 21st-Century Poetics for more articles on these postmodern approaches. One example of this appropriative poetics is Frank Davey’s book, Bardy Google . He composed [the book] primarily from the results of Google queries governed by a series of complex, rigorous rules, thereby turning the seemingly innocuous phrase into cliché or cipher (Bradley 122). This is an emerging expression of found textuality using digital technologies (beaulieu and Betts 257). Similarly, Eric Zboya’s poem IT WAS: born of stars produces a visual array by running words through a computer algorithm, using one symbolic code (computer programming) against another (written language). Thus, here we can see the relationship between visual and conceptual poetry, since it is a visual poem informed by conceptual poetics. This playfulness enacts a materialist creative energy within the forms and functions of language, a mode of creativity at work as well in a number of different schools of postmodern poetry, such as in the writings of the Beat, found, TISH , and Black Mountain poets (beaulieu and Betts also discuss the connection to Charles Olson, a key theorist and member of the Black Mountain poets [see 258]). What these approaches share is a sense of the poem as thing-in-itself rather than representation or copy (Doyle 91). When language is an object for play rather than just a vehicle for communication, it becomes a material to sculpt, pull, tease, and destroy. Thus, one key element (although certainly not the only one, nor one necessarily shared by all) of experimental poetry, in its desire to rethink language, communication, and representation, is an emphasis on language as a material which can be re-tooled and creatively extended in directions other than what we might expect in order to draw our attention towards alternative understandings of language and experience. One might be tempted to call this type of writing a cop-out on real creativity (and you would be right in some ways: American writer Kenneth Goldsmith, one of the leading conceptual writers today, purposefully calls this work uncreative writing ). However, these texts are not empty expressions but rather challenges to what we consider expression itself. By taking, altering, and contesting what we consider intentional, authorial, creative production, as well as what we consider to be sensible writing, these texts call into question our basic assumptions about literature and language themselves, in particular how and why we represent things through them. They use this variety of approaches to redirect readers towards experiences in novel ways. In essence, this is often cheeky, irreverent poetry with a purpose. But, some visual poems are very abstract, pushing us beyond representational language to the poem as thing-in-itself through an extreme focus on the visual elements of print and codification (these are often referred to as asemic or non-semantic poems). Similarly, other conceptual poems defamiliarize uses of language so extensively, or are so extreme in their focus, that they are very difficult to make sense of in terms of traditional literary expectations. These poems tempt one to ask, how is this even poetry? especially since the visual poems often look more like abstract artwork. These works certainly invite this question. 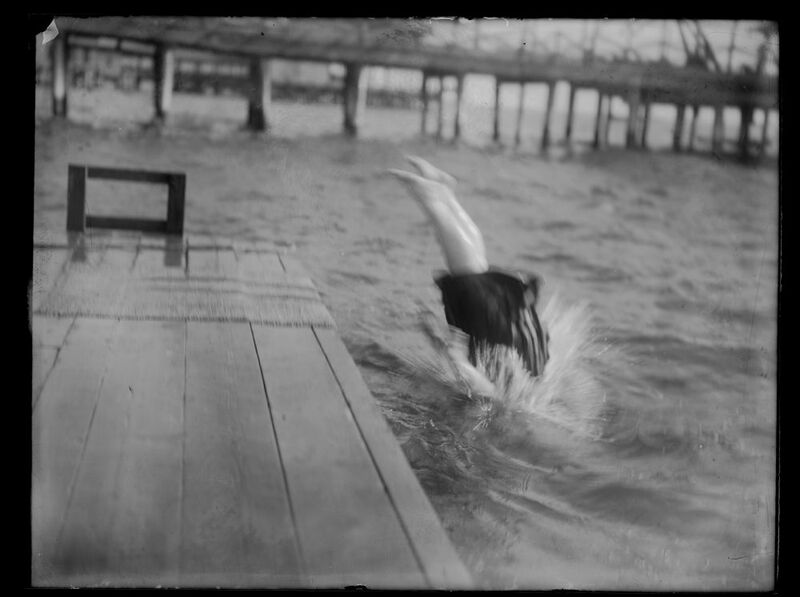 Borderblur, or Elaine Golding, Swimmer, ca. 1900. W. M. Vander Weyde, George Eastman House Collection, 1974:0056:1079. The simplest response is that visual poems are both art and poetry. They are a part of a broader experimental inclination to construct works that transcend traditional divisions of modes of expression. Many poets and artists call this borderblur (see Nichol 78) or intermedia (see Higgins). Because they use patterns of language that reflect on our use and understanding of it, these poems reflect poetic and literary conventions which often work through metaphors and literary forms to open up how we approach our experiences and how we represent them in language. At the same time, visual poems must also be considered artworks, which are interested in exploring the visuality, materiality, and texture of forms and images including print and typography (things we often overlook when we read). However, these works remain tied to aspects of linguistic representation, and this justifies calling them poetry too, even if they trouble the notion of literacy and reference that we assume when approaching literary works. Importantly, an alternative response to visual poems and conceptual poetry more broadly would be the inverse of the previous one: what is poetry? The link between questions of literature and art allows us to close-read these works. Since we won’t always find words, we need to pay more attention to the connections and limitations of visual (and sometimes inferred aural) qualities of linguistic representation and their creative uses. After all, we still have the relationships between forms, potential imagistic cues, and descriptive titles to ground our engagements with these image-texts. Bradley, Nicholas. Four Ways to Write a Poem. Canadian Literature 212 (2012): 122–24. Print. Mancini, Donato. You Must Work Harder To Write Poetry of Excellence: Crafts Discourse and the Common Reader in Canadian Poetry Book Reviews. Toronto: BookThug, 2012. Print. Nichol, bp. some afterwords. The Cosmic Chef: An Evening of Concrete. Ed. Nichol. Ottawa: Oberon, 1970. 78. Print. Cage, John. Writing through Finnegans Wake . Tulsa: U of Tulsa, 1978. Print.